Phosphate levels have long been the debate of reef keeping aquarists, with folks generally falling into one of two categories. Most hobbyist have the persisting opinion that elevated phosphate concentrations are generally bad because they fuel algae growth and prevent coral calcification. The other group takes almost an entirely opposite approach. They actually welcome slightly elevated phosphates because of a plethora of reasons, including the desire to avoid chasing numbers, to avoid using certain types of artificial controls, or simply because their phosphate levels have had a beneficial impact on their coral growth and haven’t led to other issues. Regardless of which side of that aisle you fall on, there is a big underlying problem with determining the amount of phosphate in your aquarium water…it just cannot be done accurately by the tools readily available to the aquarium trade. Phosphate checking in the aquarium hobby is tackled with two different methods. The longest standing method is based on titrating a water sample with a couple of chemicals and comparing the color change to a scale of phosphate concentrations. This method is quick and easy to use, but it doesn’t offer the resolution that aquarists often need. Most of the time, if the phosphate isn’t really high, it shows as zero on the scale and aquarium keepers are lulled into a false sense that their water is phosphate-free. The other method for determining phosphate is the one demoed in the image above…using a handheld colorimeter to give a digital readout of phosphate concentrations in a very low range. With this method, reagents are added to a water sample and a light is then passed through the sample with some type of detector reading the absorbance of the light. This absorbance is converted to a concentration, which is given on a digital readout on the front of the device. But aquarists are finding issues with this test method as well. 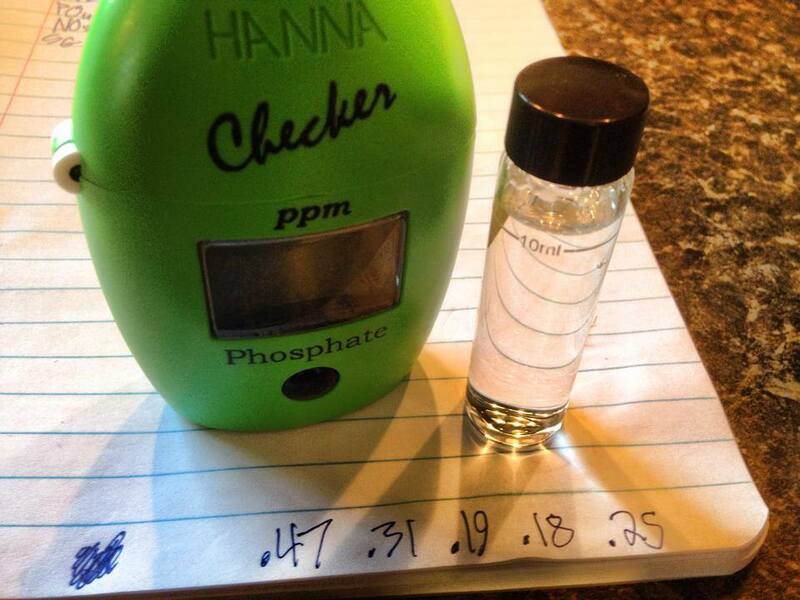 As recently demonstrated by our friend Ben Johnson, who owns and operates Captive Aquatic Ecosystems, a high-end aquarium maintenance company here in the Houston area, testing phosphate with a handheld colorimeter can yield imprecise and potentially inaccurate results. He used a Hanna Instruments Phosphate Checker to record 5 data points from one of the aquariums he services and recorded the results. According to Ben, he always performs 5 checks and then averages the results to get a ballpark figure for the aquarium’s phosphate levels. This is actually a very good way to collect data, and it is a common method used in labs across various industries, but I digress. Ben’s numbers vary pretty significantly from one to the next, with only two of the five being close to each other given the instrument’s reported accuracy and precision. On a personal note, my day job includes testing water samples for things like phosphate with equipment that costs tens of thousands and sometimes even hundreds of thousands of dollars. It’s easy to get good, repeatable data with these instruments. So, to all of those people chasing the numbers, either because they want super low phosphate or actually want to add it, you probably can’t get good test results from any of the methods currently available to the trade that are cost effective. It just cannot be done. And I’m not relying just on Ben’s experience to draw this conclusion. We too have used the Checker and similar devices with frustrating results, and we hear story after story of hobbyists who doubt the data. This isn’t meant to be a jab at Hanna Instruments’ devices by any means. We actually think they make good products. But given the fact that water testing can be imprecise, the instruments have limitations, and hobbyists don’t know how to use the equipment…we don’t have a lot of confidence in the process as a whole. And to clarify what we mean by hobbyists not knowing how to test, we simply mean that they don’t have the knowledge or means to accurately test the water like a lab would. Reagents going bad, contamination fouling up the sample, and simply eyeballing volumes or not following the steps fully can all skew the results. Without the proper training, how can you expect a hobbyist to fire off a quick and accurate/precise string of tests? You simply can’t. So, that’s how water testing has its problems and a big reason why we don’t give it too much weight. Ammonia and nitrite testing are great ways to see how your aquarium’s cycling is going, but using test results to change your husbandry techniques can be very problematic. The Hanna instruments clearly specify the accuracy of 0.04 ppm’s with +- 4% for the phosphate colorimeter. And they have a phosphorus ultra low checker that have the sensitivity needed in the reef system parts per billion instead of the parts per million of phosphate colorimeter. I will like to see the same test’s done with the ultra low phosphorus checker before saying there is not a way to have accurate ways to test this parameter. The hannah phosphate checker in particular is crippled by the fact that it uses a powdered reagent and the meter has an auto-off feature (assuming you dont use the push/hold 3 minute timer) which may not give enough time to get the sample fully dissolved. He’s getting varying readings because 1) the bottle is scratched, smudged (wipe before every reading) 2) the powder isn’t fully dissolved or 3) there are bubbles in the cuvette area where the LED takes it’s reading. There is a reason that results are so repeatable on the hannah alk checker, and that reason is a rapidly soluble liquid reagent. Additionally, the accuracy of the meter is 0.04 ppm OR 4% of total reading, whichever is greater. So when you get to the low end (0.05 ppm range) which is where most reefers like to keep their readings, you start to lose some accuracy. Some other things that can affect accuracy are using different batch dates between samples, not triple rinsing with DI water between samples or not pre-rinsing the cuvette prior to sampling.